Many river basins of the world are experiencing stresses on their water resources, both from the perspective of quantity and quality. This, of course, is not exclusive to the developing countries, but applies also to several countries in the developed world. For example, consider the water resources situation on the Colorado River basin in the southwest United States. This river basin is the primary source of water for a number of states in this area, among them California, Arizona, New Mexico, Nevada, Utah, Colorado, and Wyoming. 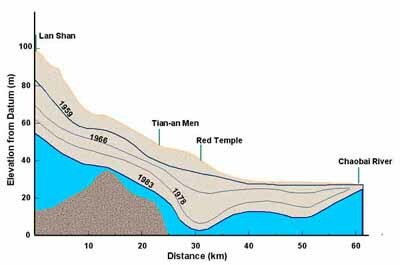 The figure below shows that, with the construction of the last major reservoir (Glen Canyon Dam) in 1960, all of the water resources of this river basin are fully utilized by the time the water reaches the Mexico border. The 1995 U.S. census puts the population of these southwestern states at 45 million, a figure projected to reach 64 million by the year 2025. We may be facing a very unsustainable situation with respect to the future availability of water, for all its intended purposes, to meet the needs of the added population. Further complicating the situation is the issue of water quality. The head waters of the Colorado River are of good quality, where the total dissolved solids (TDS) are about 55 parts per million. By the time the flow reaches the border of Arizona and Mexico, the TDS concentration has increased to 800 parts per million, primarily a result of the return flow from irrigated fields as well as from some natural causes. Similar scenarios are being experienced worldwide. 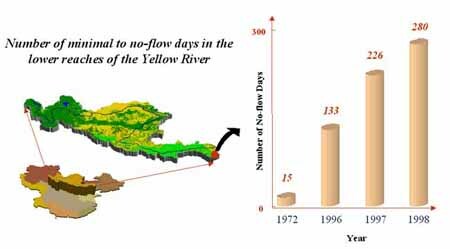 The figure below illustrates the number of days where no river water reaches the Yellow Sea just off China's coast. 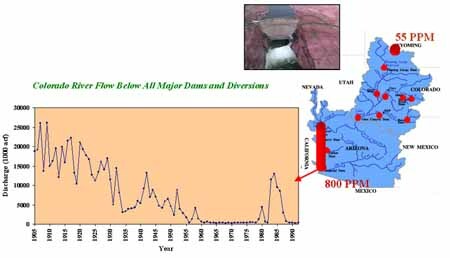 As evident, the number of no flows has increased from 15 days in 1972 to 280 days in 1998. This is a dramatic increase in the utilization of all the water resources of a major river basin. The primary message of the two above examples is that the sustainability of surface water resources worldwide is an important issue which the global community must address. The reason this is a global community issue is that agricultural and/or industrial products, for example, in the United States or China, are consumed worldwide. If any of these sectors become nonsustainable due to shortages of water, then there would be a negative global impact. An additional complicating dimension to the water resources supply and demand issue is the impact which future climate and global change may have. No matter which climate model ones believes in, the fact remains that, with an increase in global temperatures, the hydrologic cycle will intensify. The result of this intensification will be experienced differently by various regions of the world. Among the wide range of scenarios are that some regions will experience increases in precipitation, not only in terms of average increases in trend, but also in severity. Other regions might experience a decrease in precipitation and, hence, periods of prolonged and sustained droughts. In the mountainous areas of many parts of the world, we may see a drop in the snow line and perhaps a shorter winter season, where the snow will remain in the mountains. The status of ground-water resources in many parts of the world, particularly in arid and semi-arid regions, is also a major issue to be concerned about in the new millennium. Many regions of the world are relying more heavily on ground-water resources, not only for domestic consumption but also for irrigation and industrial purposes. In areas where irrigation from ground water is practiced, similar rapid declines in ground water have been experienced. This is a worldwide phenomenon. The impact on land subsidence has varied from a uniform settling of the ground level to the occurrence of sinkholes, depending on the underlying geological stratiform. While the extraction of ground water to meet these demands is one aspect, issues about the ground-water quality are of even more concern. Problems are on the rise, particularly in developing countries, due to not only population increases but also to pressure to become self-sufficient in food supply as well as developing a strong agricultural economy. Agricultural return flows and infiltration can dramatically increase the salinity of both surface water and groundwater supplies. Another potentially important water-quality problem is the issue of arsenic in drinking water. A water-supply success story, particularly in Bangladesh and India where many shallow hand pumps were installed to improve water supply, has been dealt a direct blow by the recent discovery of arsenic in the ground water. During the past two decades, over 80% of the population in Bangladesh achieved access to drinking-water supplies from hand pumps. With the utilization of water and, hence, the decrease in the water table, the chemical composition of the naturally occurring arsenic became highly poisonous, resulting in a very serious mass poisoning problem, not only in Bangladesh but India as well. The science of monitoring and, therefore, avoiding such problems is well at hand, but there is no coordinated effort to date to provide these communities with test kits and the knowledge required to prevent irreversible health damage. This problem could well be an important planetary emergency, where the World Federation of Scientists could consider as a monitoring activity.